When elders are called on to discipline a person it is a critical moment in the life of the church. Here are a couple of points we think are valuable when it comes to this subject. When elders get it wrong they can really hurt people. Many issues do not require intervention, in fact many issues should simply be killed with neglect. Another mistake elders make is when they dishonour the roles of husbands and parents in peoples’ lives. No wife or child should be disciplined without the spouse/parent involved. The exception being if someone addresses a crowd with heresy or divisiveness, which should be lovingly dealt with at the time, rather than coming back to it at a later date. The old testament and its rituals point us to the New testament and the Gospel. In Romans 2:28 we see what circumcision really means. 28 For no one is a Jew who is merely one outwardly, nor is circumcision outward and physical.29 But a Jew is one inwardly, and circumcision is a matter of the heart, by the Spirit, not by the letter. His praise is not from man but from God. It is a serious matter as God deals with the heart by marking the heart and God calls for obedience in following him from the heart. As “Spirit led” leaders, when we presume to discipline someone we are not adjusting outer beacons, we are dealing with the heart. We are involved in heart surgery. This is a life-threatening procedure. Sharp instruments are necessary. The sharpest we have is the WORD. When we use policy or opinion or common sense or experience we are taking out an instrument as blunt as a butter knife. Clean hands are required. If the surgeon does a perfect job with dirty hands the patient may still die from infection. Jesus spoke about this to the Pharisees, who were trying to correct others while hypocritically being guilty of the same offences. Most discipline should be in a private place. No heart operation is done in a public space, it complicates everything. 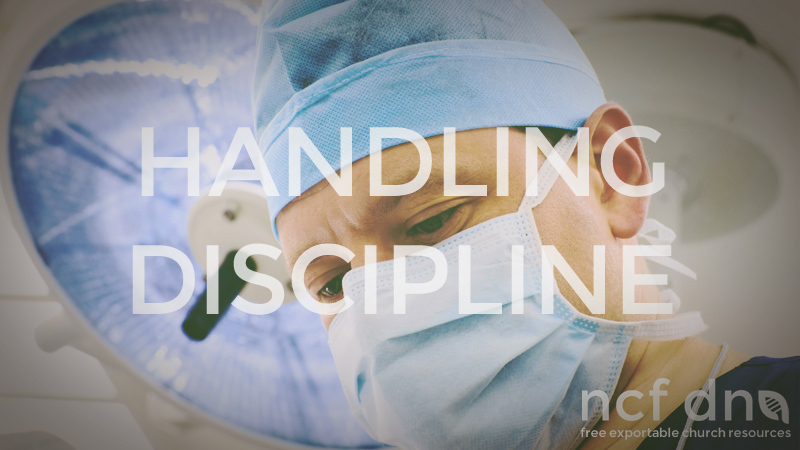 Prayer is needed before discipline as much as anaesthetic is needed before an operation. Recovery is important. We need to be able to separate the person from deed. Surgeons are clinical, not emotional. All heart operations will be done in team. We hope that this resource blesses you and the way you deal with discipline in your church. Feel free to print, edit and distribute this document.